At Master Mechanic, we’ve completed every repair imaginable and worked on everything from classic cars to brand-new vehicles. It may not be too long before we find ourselves being chauffeured around by a self-driving car, but today’s vehicles have a lot of amazing technology already packed under the hood. In recent years, automakers have focused on integrating active safety systems like automatic emergency braking, lane departure warnings, and blind spot alerts. Aside from safety, what does this mean for you? There’s no doubt about it: these features save lives and help prevent collisions on roads across North America, but they definitely won’t save you money on repairs. 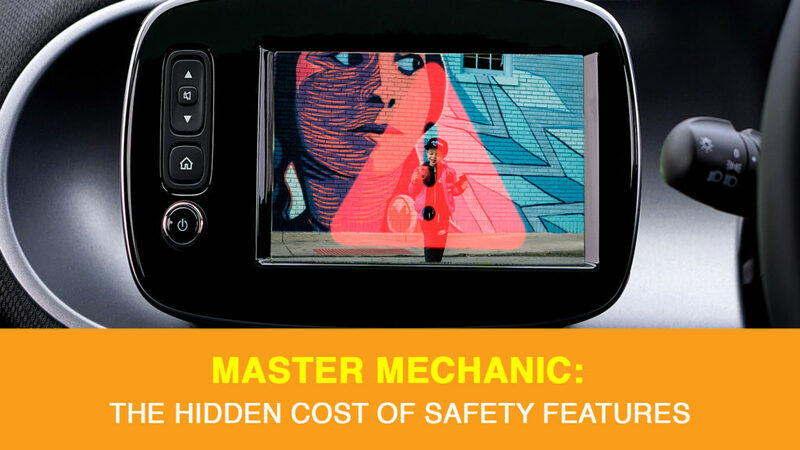 A new study from the AAA shows that these safety features usually come with an underlying price tag. While it’s not something you want to think about when getting a shiny new vehicle, cars with radars, cameras, and other sensors are typically much more expensive to fix in the event of a collision. Depending on your insurance coverage, if you are involved in a collision the repair costs may not be covered by your policy. Fixing a minor collision usually costs under $1500. However, when that fender involves a rear-facing radar? That cost of the repair can double. A rear-end collision isn’t much better. It could cost thousands extra if your bumper has a sensor or built-in camera. To do their tests, the AAA looked at three cars: a Toyota Camry sedan, a Nissan Rogue crossover, and a Ford F-150 pickup. The research team looked at the cost of the parts that make up their active safety systems, how much labour it would take to replace them, and how much time it takes to calibrate new parts. Are New Safety Features Making Roads Safer? In 2016, there were 115,000 reported collisions across Canada. While that is still a lot of accidents, that number was 142,000 just 10 years earlier. That significant drop can be partly attributed to advancements in car safety features. We’re certainly not trying to deter you from the benefits that come with the latest safety tech, but we want you to be fully aware of what you’re getting into. According to a recent Ipsos survey conducted on behalf of accounting firm MNP, more than 50% of Canadians are living within $200 of not being able to afford their monthly bills. It’s easy to see why an unexpected car repair can really set Canadian drivers back. The good news is that as these safety systems are added to more and more cars, the technology they use becomes cheaper to access. Car manufacturers are always striving to offer consumers the latest and greatest technology, though, so we’ll have to see how long it takes for the costs to come down. When looking at a new car (or new to you), it’s important to remember that added features come with the potential price tag of repairing them. If you have any questions about how much a system might cost to repair, or are looking for an honest quote on the service you need, don’t hesitate to contact your local Master Mechanic. We’re always happy to help! < Ask A Master Mechanic: Is Highway Driving Necessary?